When your parent enters into an aged care facility, they may be asked to pay an aged care bond. If you’re wondering what aged care bonds are, and whether or not your family will need to pay this fee – continue reading as we help you understand it. What Are Aged Care Bonds? First off, what is the aged care bond? Aged care bonds are are also referred to as Accommodation Payment or Refundable Accommodation Deposit (RAD). A bond for aged care is similar to paying a bond for an apartment rental – the difference being that aged care bonds are usually much more. The resident of the aged care facility is charged this refundable bond, by their chosen facility in addition to their other daily costs and fees of living there. The full amount of the bond is returned to them or their estate when they leave the aged care home. The amount you pay as the bond, will usually depend on the resident’s income, assets and of course on the type of aged care facility you choose as well. Anyone with less than $48,500 in assets will usually not be asked to pay a bond. Choosing a payment method may be confusing and you want to choose one that won’t affect your parent’s pension or leave you with a heavy financial burden. You may want to consult a financial adviser before you make this decision. They will help assess income and assets to make an estimate of what your bond fee will be. They will also help you choose the payment method that is most well-suited to you and your family. An aged care residential facility is required by law to invest the aged care bonds in approved investments. They then use all the income earned from the bond to improve their accommodation and services. Often, people will sell their homes to pay for the aged care bond in full, although this entirely depends on each family’s individual financial situation. Whether or not to sell the family home is an important decision that comes with huge financial implications. An expert aged care adviser can help to assess your financial situation and advise on what needs to be done to pay the bond while making sure that your wealth is preserved. There’s no doubt that aged care bonds are a confusing issue. To help make the process less daunting for you and your loved ones, don’t hesitate to seek an expert’s advice. An aged care adviser can not only help you understand the fees and costs involved in paying for aged care accommodation, they will ensure that you only pay what you need to pay and nothing more. At Core Value, our one number one goal is to take the stress out of your aged care financial decisions because we realise that there’s no greater treasure than peace of mind when you’re faced with a difficult decision. Using our expert strategies we’ll help you minimise your bond fees, show you how to maximise Centrelink benefits, and protect your family’s overall estate. 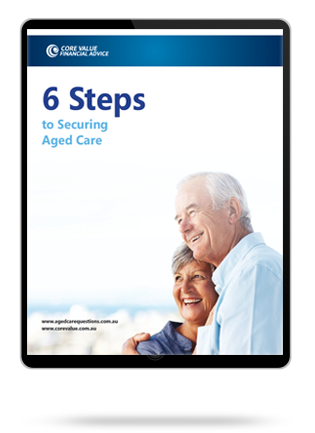 Don’t carry the burden of making aged care financial decisions all on your own. Give us a call on 1300 944 011 to schedule a free consultation with an expert financial adviser to help you through the process.